This statistic shows a forecast of the forecast of the population with a Western foreign background in the Netherlands from 2015 to 2060 (in millions). 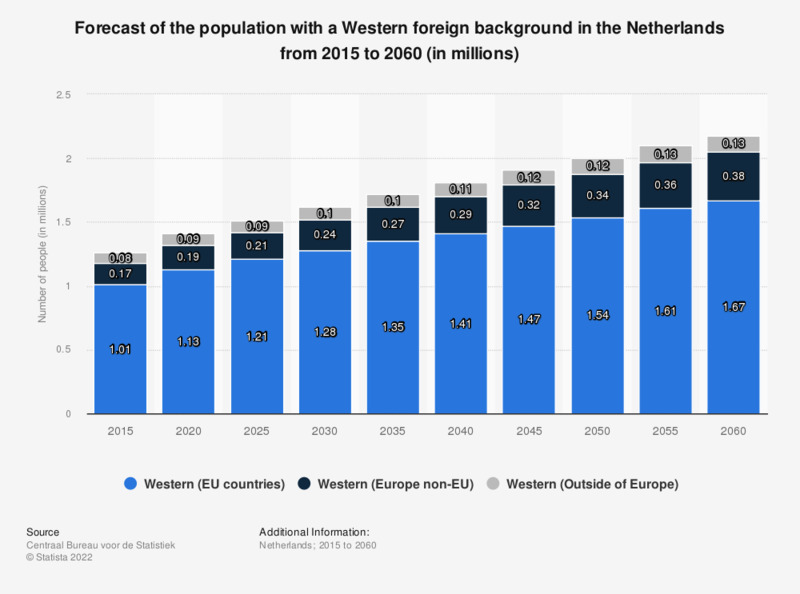 It reveals that the large majority of the Dutch population with a foreign background between 2015 and 2060 will likely originate from other EU countries. The population from non-EU countries in Europe and outside of Europe is forecast to be much smaller. All three populations of Western migrants are expected to grow: the EU population from 1 million in 2015 to 1.67 million people in 2060, the population from other European countries from 170,000 to 380,000 and the population from outside of Europe from 80,000 to 130,000. Persons with a Western background: someone who has at least one parent born abroad in Europe (excluding Turkey), North America, Oceania, Indonesia or Japan. Because of their socioeconomic and cultural background people from Indonesia and Japan are also considered Western. All others are considered non-Western. First generation migrants have as country of origin the country where he/she was born. Second generation migrants have as country of origin the mother's country of birth, unless that is the Netherlands. In that case the country of origin is the father's country of birth.